A. Finn Enke. 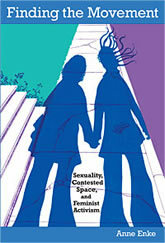 Finding the Movement: Sexuality, Contested Space, and Feminist Activism. Duke University Press, 2007. In Finding the Movement, Anne Enke reveals that diverse women’s engagement with public spaces gave rise to and profoundly shaped second-wave feminism. Focusing on women’s activism in Detroit, Chicago, and Minneapolis-St. Paul during the 1960s and 1970s, Enke describes how women across race and class created a massive groundswell of feminist activism by directly intervening in the urban landscape. They secured illicit meeting spaces and gained access to public athletic fields. They fought to open bars to women and abolish gendered dress codes and prohibitions against lesbian congregation. They created alternative spaces, such as coffeehouses, where women could socialize and organize. They opened women-oriented bookstores, restaurants, cafes, and clubs, and they took it upon themselves to establish women’s shelters, health clinics, and credit unions in order to support women’s bodily autonomy. By considering the development of feminism through an analysis of public space, Enke expands and revises the historiography of second-wave feminism. She suggests that the movement was so widespread because it was built by people who did not identify themselves as feminists as well as by those who did. Her focus on claims to public space helps to explain why sexuality, lesbianism, and gender expression were so central to feminist activism. Her spatial analysis also sheds light on hierarchies within the movement. As women turned commercial, civic, and institutional spaces into sites of activism, they produced, as well as resisted, exclusionary dynamics.